To shop for self-published titles in Marketplace, select Self-published from the Shop drop-down menu. 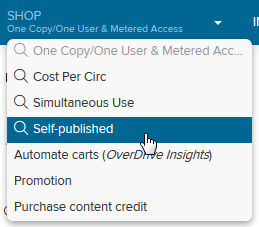 Self-published content falls under the One Copy/One User lending model, so any cart(s) you create for self-published titles will appear with the rest of your "One Copy/One User & Metered Access" carts. You can also add self-published titles to existing "One Copy/One User & Metered Access" carts. Note: The catalog of self-published content is separate from content published through the Local Content program.